We have the best CBD location in Whakatane. Take advantage of the convenience of restaurants, cafes, shops and more whilst also enjoying peace and quiet in your Tuscany Villas suite. Stay in our luxurious Super King Suite for the ultimate romantic getaway. Enjoy a dozen roses, a bottle of Italian Prosecco Treviso, chocolates and 2x eggs benedict with salmon/bacon breakfast served in your room. Godete il Vostro Soggiorno – Enjoy your stay! Discover a touch of Italy in the heart of Whakatane. Tuscany Villas Boutique Hotel offers luxury suites at competitive rates, with executive suites, family suites and deluxe king size suites and more. Explore Whakatane and the Bay of Plenty whilst you stay with us at Tuscany Villas Boutique Accommodation. Walk amazing native bush trails, surf at Ohope Beach, take an exciting tour of White Island and so much more awaits here in Whakatane. Tuscany Villas Boutique Accommodation is here to help you enjoy your special occassion. Looking for luxury wedding accommodation or planning an event? Tuscany Villas can accommodate and cater to all of your needs. Get in touch today to find out more about hosting your event at Tuscany Villas in Whakatane. 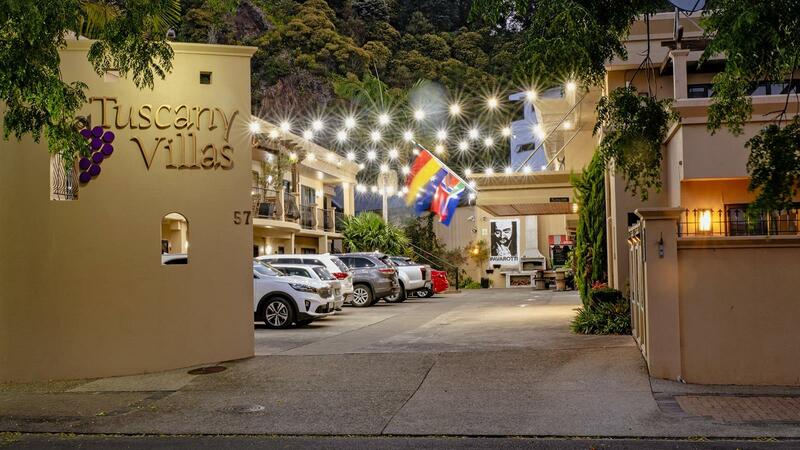 Choose the best that Whakatane has to offer and book your stay with Tuscany Villas Boutique Hotel, your luxury accommodation in the Bay of Plenty. Take advantage of our excellent location in the CBD, well-appointed facilities and superior service. Inquire about our corporate rates and automatic upgrades. You will not be short of things to do in Whakatane, from relaxing on the beach or taking a casual stroll through the shops to exciting activities out on the water or in native New Zealand bush. Whakatane has something for everyone! Family run boutique establishment in the heart of Whakatane. 5o metres from White Island tour boats, Fishing charters, restaurants and bars. We offer comfort, location and first-class service. Experience the amenities that make for a wonderful stay: spacious guest suites and one bedroom apartments, continental and full breakfast service, meeting facilities and much more! Our conference facilities and Giordano's Italian BBQ and wine bar will make your stay a memorable one. Giordano's Italian BBQ is closed during winter - Re-opens weekdays for a limited summer season - Also available for function bookings. All bookings require a credit card and photo id. “Godete il Vostro Soggiorno" – Enjoy your stay! You will enjoy luxurious fully appointed suites and rooms with everything you need, whether you are travelling for business, on holiday with the family or enjoying a romantic weekend getaway. Get in touch today to book your stay with us! There is so much to entertain and inspire in Whakatane and your hosts at Tuscany Villas Boutique Hotel are happy to organise these for you. Choose from a range of activities - relaxation, adventure, sport, tours and more. Have a look at our video gallery - Click Here!